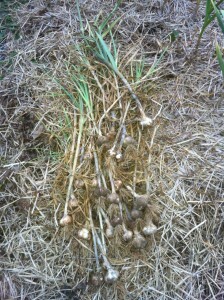 This year we harvested our first garlic on the 5th of June. This is our second season to have a garlic harvest and I couldn’t imagine our home without it. Because of garlic’s flavor and many medicinal benefits (antiviral, antibacterial, antifungal, helps prevent heart disease and cancer, etc), we include it in many of our meals. Garlic bulbs are ready to be harvested when about 3/4 of the leaves have yellowed. 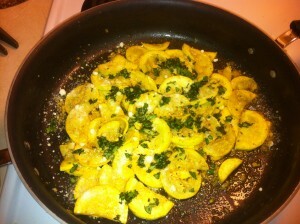 The bottom leaves will yellow and die back first. When you see 5 or 6 top leaves still left you know it’s about time to start harvesting. Depending on your geographic region and what varieties you are growing, harvest time should be sometime between June and early August. Dig bulbs carefully trying not to damage the it. Garlic must be cured before storage in order to store long term. We tie our garlic in bunches and hang on the front porch were it is warm, dry, and out of direct sun. Cure for 2-3 weeks until the bulbs are completely dry and the wrapper is paperlike. Remove as much dirt as possible and cut the roots and tops off, leaving about a 1 inch stub of the top. We store our garlic in mesh seed potato bags on a kitchen shelf. If you want to plant your own garlic and not have to buy more bulbs, be sure to save to largest bulbs of each variety and replant them in the same way you planted in the fall.